Free shipping. Buy direct from HP. 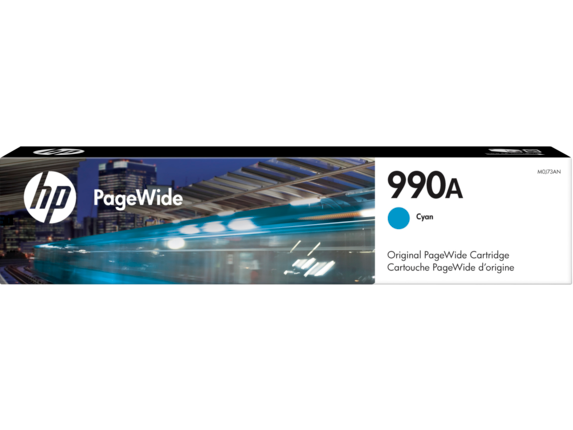 See customer reviews and comparisons for the HP 990A Cyan Original PageWide Cartridge. Upgrades and savings on select products. Replace cartridges quickly and correctly with easy-open packaging and simple, fast installation.Easily recycle your Original HP PageWide cartridges for free through HP Planet Partners. Ensure consistent printing—Original HP PageWide cartridges are designed to work reliably every time. Replace cartridges quickly and correctly with easy-open packaging and simple, fast installation.Easily recycle your Original HP PageWide cartridges for free through HP Planet Partners.Ensure consistent printing—Original HP PageWide cartridges are designed to work reliably every time. 1 Based on ISO 24711 cartridge yields for HP 990X series High Yield Original PageWide Cartridges compared with HP 990A series Original PageWide Cartridges. Learn more at http://www.hp.com/go/learnaboutsupplies. 2 Water, smear, and fade resistance based on ISO 11798 and internal HP testing. For details, see http://www.hp.com/go/printpermanence. 3 HP Planet Partners Program availability varies. For more information, visit http://www.hp.com/recycle.